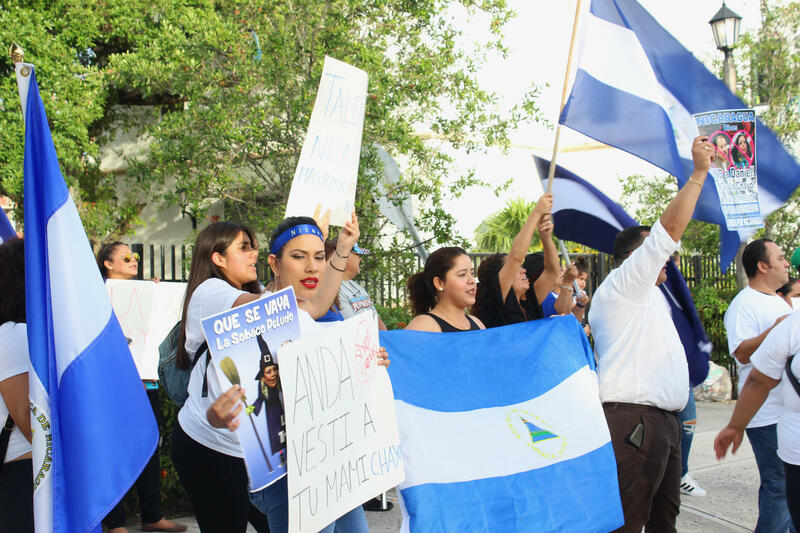 Protesters wave Nicaragua flags across the street from Miami Fashion Week shows at Ice Palace Films Studios on Friday, June 1, 2018. Nicaraguan designer Shantall Lacayo cancelled her show after uproar over her ties to Nicaraguan President Daniel Ortega. People protest Nicaraguan designer Shantall Lacayo and her ties to Nicaraguan President Daniel Ortega across from Miami Fashion Week on Friday, June 1, 2018. 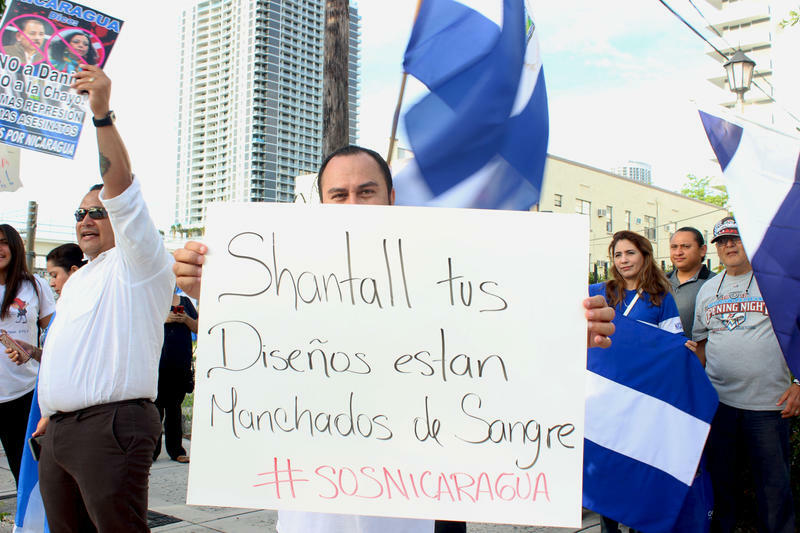 Protesters against repressive Nicaraguan President Daniel Ortega and his ties to fashion designer Shantall Lacayo organized outside a Miami Fashion Week event. 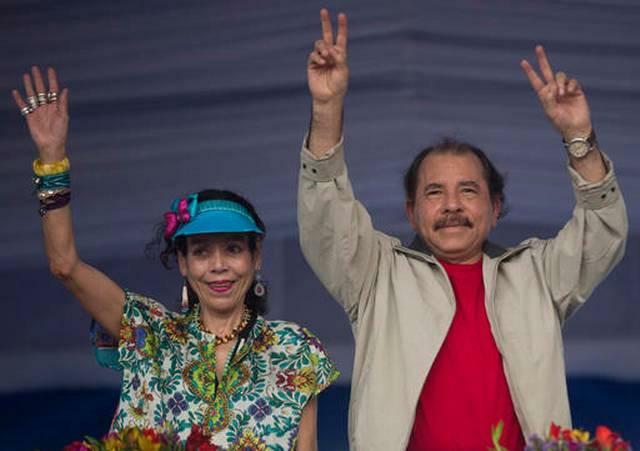 Ortega Murillo, the daughter of a president who Amnesty International has accused of adopting a violent, repressive strategy not seen in the country for years, co-founded the design platform Nicaragua Diseña with designer Shantall Lacayo. Lacayo cancelled her runway show scheduled for Friday night amid the controversy. When passing cars saw signs with slurs against the Ortegas and Lacayo, many slowed down to whistle, honk and rev their engines. 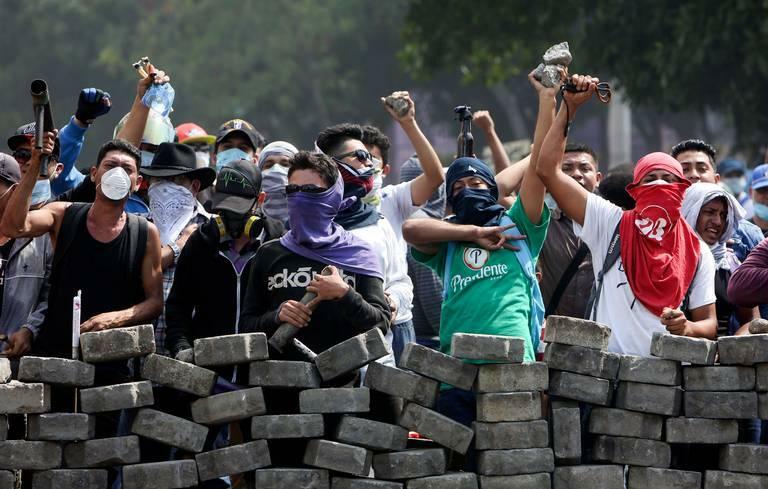 Weeks of violent unrest in Nicaragua has left some 100 protestors dead, as Ortega has rejected calls to step down. In Miami, the intensity grew Friday as protestors piled onto the street corner, screaming and posting videos online. One of the protesters, Miami resident Karen Gonzalez, said Ortega killed her family in the political uprising. “He has killed my family, because the 91 killed are my family, my people,” she said. 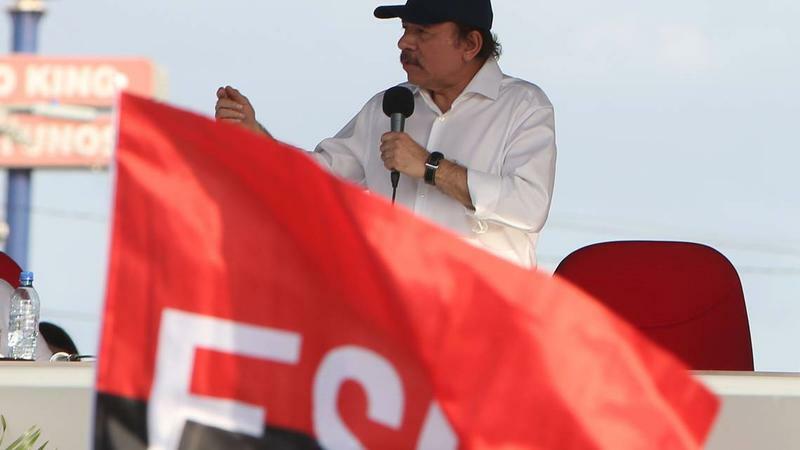 After police fired on protesters in Nicaragua last Wednesday, adding 15 more to the death toll, a potential peace dialogue between Ortega’s regime and the people’s opposition came to a halt. 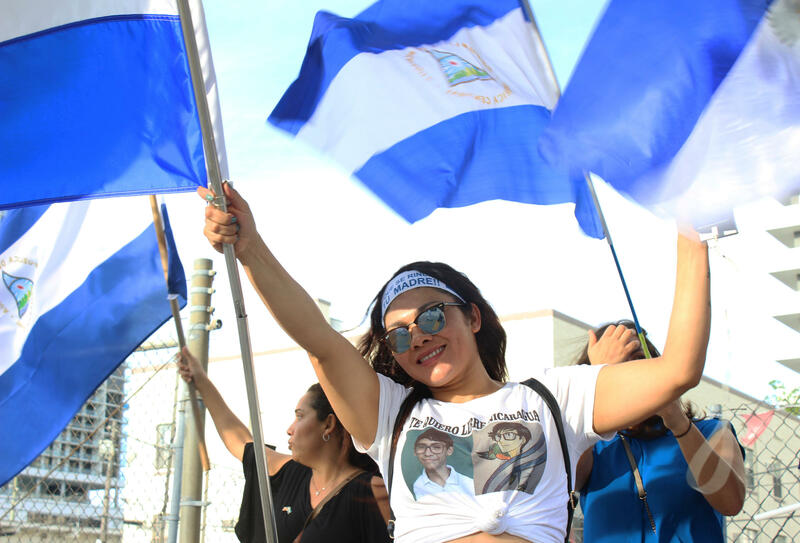 The killings happened during a march on Nicaragua’s Mother’s Day. Before this march, The New York Times reported the Episcopal Conference of Nicaragua was trying to mediate peace talks. 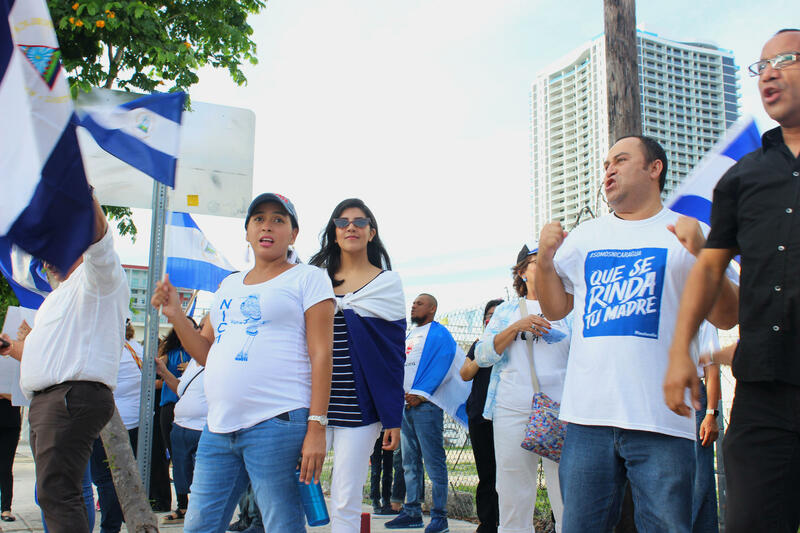 Nicaraguans in Miami have organized over social media platforms to protest. 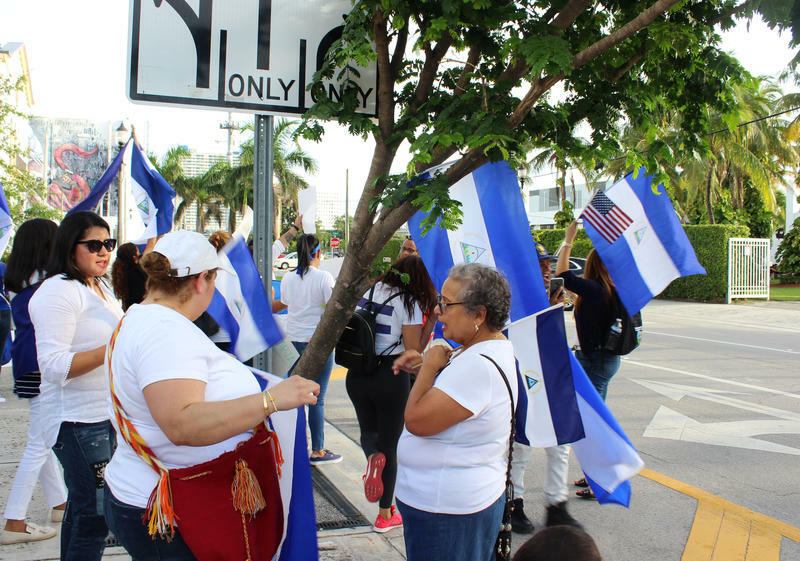 After the Mother’s Day massacre, Miami resident Dimitri Largaespada checked a Whatsapp group for protests and made his way to a corner across from Ice Palace with his Nicaraguan flag Friday. He said there is no political association, no overarching civil rights group that organizes these protests in Miami. But he said they are growing, and that protestors want to show family members back home in Nicaragua that they are not alone. A meme making the rounds on social media in Nicaragua dryly sums up critics' view of President Daniel Ortega. Labeled "Questions To Be Addressed By The National Dialogue," as upcoming negotiations between the president and his opponents have been labeled, it includes only two: "When are you leaving?" and "Who are you taking with you?"